Automatic Movement is a watch with a mechanical movement that does not need to be wound regularly. Its power comes from the movement of your wrist as you wear it. The Bezel is the ring around the dial of the watch. 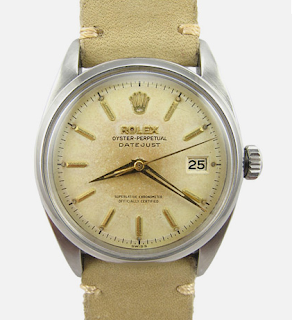 Often it has other functions, as is the case with a Bi-directional Rotating Bezel. Calibre is the size and configuration of the movement inside the watch. A Chronograph is a watch with 3 subdials within the larger dial. These are used to display other functions of the watch such as a stopwatch. The Chronometer is a standard set by the Official Watch Institute of Switzerland. The watch will have been rigorously tested for its accuracy at various temperatures and in different atmospheres. A Cosmograph is the same as a Chronograph, except that the tachymeter function is found on the bezel of the watch. The glass on a watch can be made of Plexi Glass (a synthetic crystal) or Sapphire Crystal, depending upon its make and age. A Dual Time Zone watch can display at least 2 time zones by means of a subdial or an extra hand. The End of Life indicates the end of life of a battery within a quartz watch by successive jumps of the seconds hand of 4 seconds, or a flashing digital display. Frequency is the number of vibrations a second in hertz. The Flyback hand is a seconds hand on a chronograph that is used to determine lap or finishing times. GMT or Greenwich Mean Time is used as universal standard time. The Helium Escape Valve is a decompression system allowing helium to escape from inside the watch. Horology is the art and study of watch making. Within a mechanical watch the Jewels are used as bearings. Most watches with mechanical movements will contain at least 17 jewels. The Lugs can be found on the case, where the bracelet or strap is joined. Mechanical describes a movement with a balance wheel., and a mechanical movement is a movement based on a mainspring which is wound by hand - when wound, it slowly unwinds the spring in an even motion. An automatic mechanical requires no winding because of the rotor, which winds the mainspring every time you move your body. Military or 24-hour time is time is measured in 24-hour segments. To convert 12-hour time into 24-hour time, simply add 12 to any p.m. time. To convert 24-hour time into 12-hour time, subtract 12 from any time from 13 to 24. H.Samuel mens watches are well worth checking out if you want a stylish timepiece.